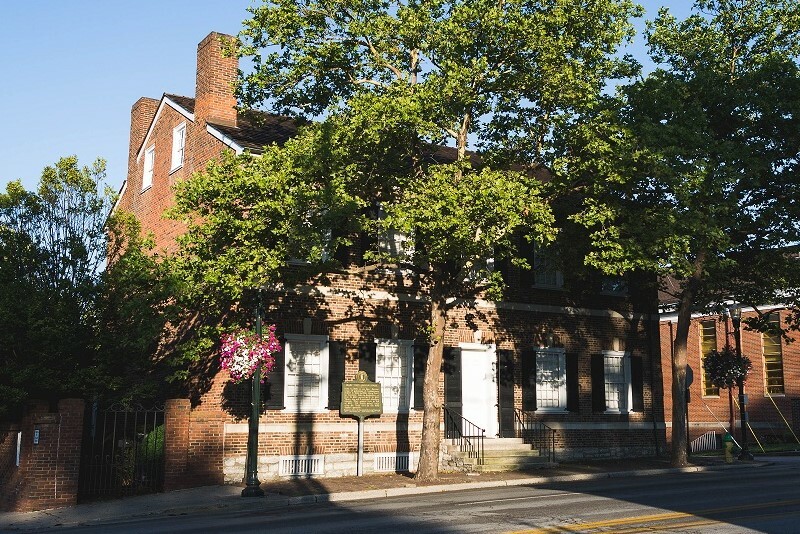 The Mary Todd Lincoln House, located on West Main Street in downtown Lexington, Kentucky, was the family home of the future wife of the sixteenth President of the United States. In 1977, the girlhood home opened to the public and became the first house museum in the country to honor a First Lady. Originally built between 1803-1806 to serve as an inn, the property became the home of politician and businessman Robert S. Todd in 1832. Daughter Mary Todd, born in December 1818, lived here until she moved to Springfield, Illinois, in 1839 to live with her older sister. There she met and married Abraham Lincoln, whom she brought to visit this home in November 1847. In the Todds' day, the property contained separate slave quarters, an outdoor kitchen, wash house, smoke house, and stables with a carriage house. Unfortunately, no evidence of the outbuildings remains. The Todds also enjoyed a large garden, now partially restored, offering a pleasant place for our visitors to enjoy. The Todd family lived here until Robert’s death in an 1849 cholera epidemic. Legal disputes in the Todd family led to a public auction, and the house and its contents were sold. After the Todds moved out, the property had many uses, including a boarding house, a grocery store, and even a brothel. By the 1950s, the structure, in poor shape, was being used for storage. In 1977, led by Beula C. Nunn, the house was restored and opened to the public as a museum. Today, the 14-room house is used to tell the remarkable story of Mary Todd Lincoln to thousands of visitors from around the world, featuring family portraits and furnishings from the Todd and Lincoln families. View more photographs. Kentucky Mansions Preservation Foundation (KMPF) is a 501c3 tax-exempt organization founded in 1968 to protect the unique history of Kentucky. Under the leadership of the Kentucky's First Lady, Beula C. Nunn, the Foundation’s first project was the restoration of the Governor’s Mansion in Frankfort. The second project was the restoration of White Hall in Madison County. White Hall was the home of Cassius Marcellus Clay, emancipationist, legislator, and Ambassador to Russia under Abraham Lincoln. White Hall was transferred to Kentucky State Parks after its restoration. KMPF opened the Mary Todd Lincoln House to the public as a museum in 1977 after an extensive fundraising and restoration effort. The real property that comprises the Mary Todd Lincoln House is owned by the Commonwealth of Kentucky and leased to KMPF through a unique 99-year lease agreement. KMPF is entirely responsible for the preservation and operation of the Mary Todd Lincoln House and does not receive regular financial support from the government. KMPF depends primarily on earned income from admissions, store sales, and membership dues to preserve and operate the museum. Helm Place encompasses one hundred and fifty acres located within the agricultural-rural zone of Fayette County, Kentucky’s Bluegrass Region. The property is governed by a conservation easement and identified as a Local Landmark with an H-1 overlay. The property includes the acreage, a main house built circa 1830-1850, a “garden house” which was likely the original dwelling house, and ancillary outbuildings such as a garage and several barns. Although a caretaker lives on site, the property is not open to the public.